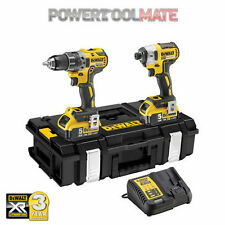 DeWalt DCKFFX9AP4 18v 4x5.0Ah XR Li-ion 9pc T-Stak Kit. Condition is New. Dispatched with Royal Mail 2nd Class. Dewalt XR 18v 7 Piece Brushless Kit 3 x 5.0Ah Li-Ion Batteries Charger Bag Stock Code: DCK7BLKIT1 Latest generation 18V XR Li-Ion Brushless technology - Find out more about Dewalts new 5.0ah technology. Brushless motor is designed to achieve up to 57% more runtime compared to brushed motors. The brushes on a conventional motor cause friction which in turn generates heat and slows the motor down. The brushless technology electronically transfers energy within the tool which allows a longer run time between charges This XR Dewalt 7 Piece Kit, contains the following: DCD796N XR Brushless Combi Hammer Drill DCF887N XR Brushless Impact Driver DCG405N XR Brushless Grinder DCP580N XR Brushless Planer DCS391N XR Circular Saw DCS331N XR Jigsaw DCL040N XR Torch 3 X .
JCB Drill And Jigsaw Set, all works as is should. Used condition. Having a clear out. Any questions please ask. Thank you. Makita 14.4v drill driver with a 2.6Ah battery and charger. Condition is Used. Dispatched with Royal Mail 2nd Class. Milwaukee 18V 3x5.0Ah Fuel Powerpack 6 PC Kit RRP £1199.00. Condition is New. Dispatched with Royal Mail 2nd Class Large Letter. 1 x 18v M18BPD Compact Percussion Drill. No Load Speed: 0-450/0-1,800/min. No Load Speed: 0-2,000/0-2,750/min. image[,,,0,,9]#. Battery QTY. Head Weight. Range Model. 1 x M18BPD Combi Drill. MILWAUKEE HEAVY DUTY SET. 1 CARRIE BAG FOR SCREWDRIVER. 3 BATTERIES.